What kind of light bulbs do you have? If daylight bulbs they could be making it appear more blue. Did you not paint a large swatch in each room prior to painting? I would be surprised that it wasn't done especially with that large of a job. Oh goodness - I hope you can figure this out! Light French Grey doesn't have a blue tint to it so i am surprised. I wonder if the paint company he got it from didn't provide the correct color. lighting. 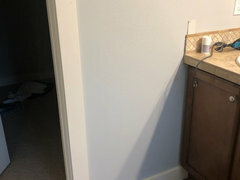 He did not test a whole wall but we did do a sample by the wall, but not every room. I see lavender. I suspect its the way the lighting in your house plays with your flooring etc. I see baby blue too. I would be as sick as you are. It's not a terrible color, but I can sure see how that is not at all what you were expecting. 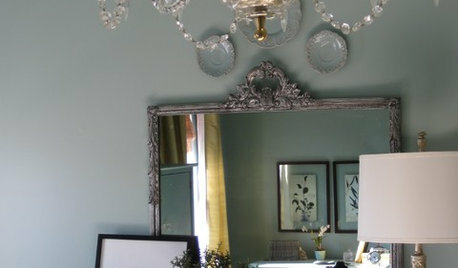 Changing the color of your trim won't change the blue tone of the walls. I am so sorry and hope you find a workable resolution. Is that beige carpet? That could be contributing to the perception of blue. Yes the carpet is a beige/taupe... but it looks blue even with our hardwood ‍♀️ Do you think a grey with more of a taupe/brown base like repose would work better? Would you consider something other than gray? 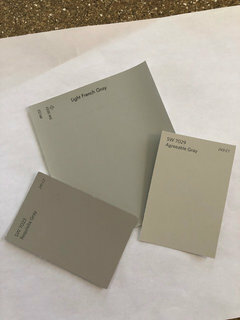 It seems that 90% of the discussions on these boards center around " choosing the right gray". I would choose a warmer color that will work better with your carpet. All color perception is influenced by neighboring colors. If the carpet is a warm tone, grey on the walls may appear blue by contrast. Small paint swatches can be inadequate in predicting such visual interactions. To avoid a blue effect, I'd go with a color that compliments the carpet, even if it is on the warm side. I hope this decorating grey obsession will pass soon. Not every house has the right elements to be painted grey and in this case the carpet isn't a good complement to grey and possibly the yellow-ish trim either. Jc, I think that looks quite lovely on your walls! I would live with it awhile. 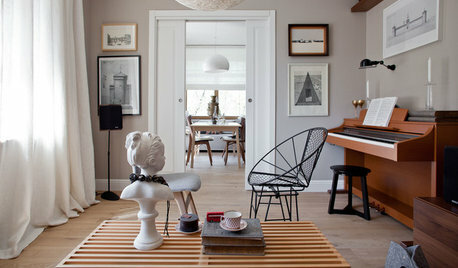 You don’t have anything on the walls yet; once you hang art you may find this a very appealing gray! Do you have all your furniture back in yet? 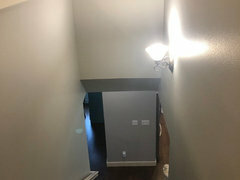 Btw, I just looked up Light French Gray and it’s not your lighting! This is definitely a gray / blue. But it’s very pretty and easy on the eye. You can clearly see the blue tone here in comparison to the more gray tone of mindful and repose gray. 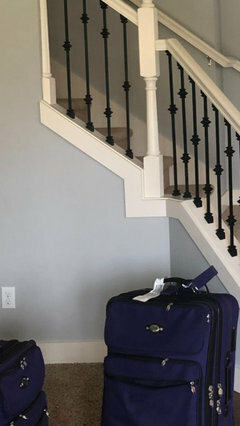 I think the staircase picture looks very nice! Try to relax. Put your decor on the walls, live with it for a bit to get accustomed to it. Any color would be a shock after 9 years and you may have to change accessories like pillows to compliment this new color. We have it too and it never ever reads blue. In our space it looks true gray and sometimes takes on a very light lavender touch. I’m sorry it doesn’t work in your space. Try switching out some light bulbs to a cool white. 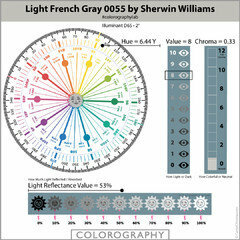 When we evaluate Light French Gray under a reasonably balanced light source, it belongs to the Yellow hue family, approaching the Green-Yellow hue family. It also has a REALLY low Chroma value of 0.33. Which means it's a near neutral. Near Neutral literally means it's near a true neutral gray. All of that rolls up to indicate that Light French Gray is easily influenced by context and light sources. Shifting baby blue under certain lighting conditions isn't surprising. 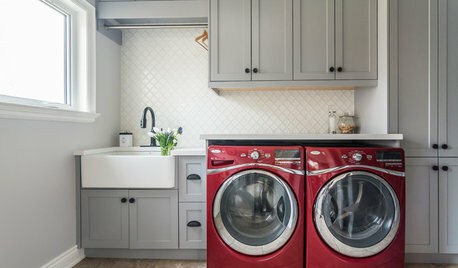 The solution to choosing a new near neutral is to choose a near neutral from a different hue family and/or a color with more Chroma, more colorfulness, one that isn't as close to a true neutral gray. Colors like Agreeable Gray, Balboa Mist, Pale Oak, etc. I actually prefer this color with your carpeting and woodwork rather than a true grey. The term "French grey" normally refers to a greyed blue, so I'm not surprised with the result. I’d live with it for awhile .... i kind of like it. I think the problem is that it’s probably not a perfect choice considering other surfaces in your home. 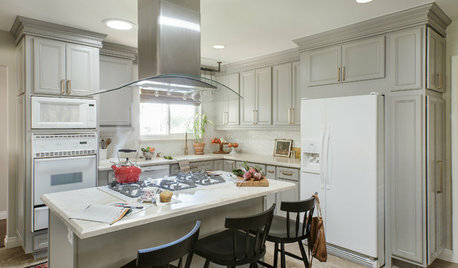 Paint Colors are influenced by so many other factors in a home. For example, Edgecomb Gray turned violet in my home, not the look I was going for. I'm curious what paint the painter used . Could you take a picture of the label so we can verify the color. I also have Light French Gray in a bathroom and it's not blue. I am surprised it's so blue. 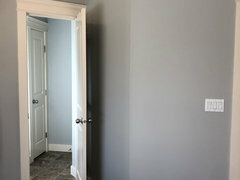 Sometimes painters will color match to a preferred or cheaper paint brand ... as mentioned above you might want to check what you actually got. I actually like it from the one picture you posted. I painted my entire downstairs shades of grey & am already a little bored by it. Any chance it will grow on you? Your trim is too ivory for that color. Your carpet is too warm for that color. That's.............truth. Try Ben Moore Edgecomb. And try it first on a most visible full wall, in an area with CARPET. 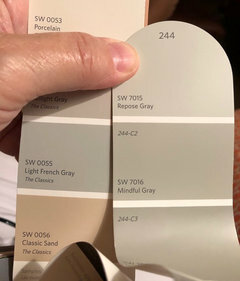 It is definitely Sherwin Williams light French gray that he used - not an off brand. I have the can And that is where he has his account. Yeah, most likely this plus the inherent qualities of the light. Kind of made the perfect storm that was hard to see coming. Jc, LFG reads a tad blue in my bright Florida sun too;)! I have to say I think it looks rather lovely in your home, especially with your tile. I know it’s not exactly what you expected but it may end up being a nice mistake. That is so wrong to make conclusive statements like that and, frankly, it's just down right mean to mislead people that way. Every single one of those colors - because of their hue family and/or chroma - has the potential to shift purple/blue/violet depending on the light source. Getting the correct color from advice on a forum is a cr@p shoot at best. There are countless threads asking to pick the right color yet being in the space is the only true way to do that! There are just too many variables and it matters not one bit how wonderful any given color looks in someone else’s space. If “ seeing” color is hard for anyone then spend the extra $$ and hire a color consultant; spare yourself the trauma and extra expense of a costly mistake. Any one of the more obviously warm leaning grays, especially those with a greener undertone, will look better ( LESS blue) with the existing warm elements in the op's home. Failing a rip of all the obvious warmer elements, ie a change to bright white trim, a removal of carpet, a rip of the tile etc.....? An improvement to a bit less blue perception is likely. 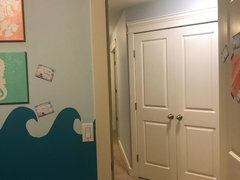 The amount of improvement will vary by wall and room, indeed will be a factor of the exposures, lighting in the room, time of day and all the usual things that make posters nearly insane...... over paint. lynartist said it best. colors are chameleons, changing with the light and surrounding colors. it's the most difficult part of decorating a room. I've learned a lot since then. All gray colors, even the warmer ones, have blue in them. It doesn't mean all of them will appear blue in your house, just that they could. A paint color is actually made up of many colors and all of those can show as undertones and be affected by your lighting and the other colors near them. The other thing I learned: If you can, don't just pick a paint color for the walls -- Pick a color palette. Start fresh with wall, trim, and other surrounding colors if necessary. Then you know that everything is working harmoniously together. If you cannot paint your trim, then the color you choose for the walls needs to work well with your existing trim, furniture, and lighting. 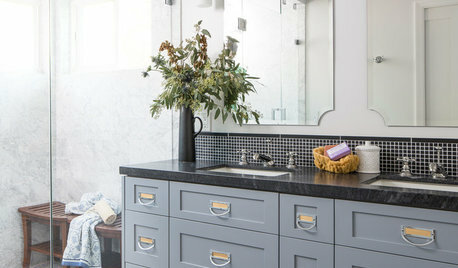 This might mean that you may not be getting a "gray" paint color. You say you are done with builder beige, but you can find a "beige" that looks "gray" in YOUR home. 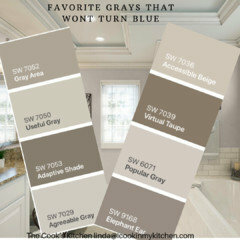 Don't pay attention to the names that the paint companies assign to the colors and please don't just choose Agreeable Gray, Colonnade Gray or any color just from looking at the paint swatches or just because some expert claims the color is "the best gray" or "won't turn blue". Lastly, I recommend anyone with Paint Sample Trauma, go get samples from samplize.com . Even those little cans of samples from the paint stores could be slightly off and not that accurate to what you might get in the gallons. Trust me, I have tested this. The big sheets sold at Samplize are using the real paint AND you can take that sheet to different rooms. No painting splotches all over your walls. "obviously warm" and "greener undertone" is useless information because it's purely subjective opinion based on your own color acuity -- not to mention we have no idea what light source you're using to make those judgments. It's equally as egregious as saying there are favorite grays that are guaranteed to not turn blue. This OP has started another thread asking to give advice between agreeable gray and colonnade gray. I have pulled thousands of colors for clients over the years but Only while standing in the space! Taking a chance on another 2 thousand $ by taking the word of a stranger on the net seems foolhardy to me! I trust my eye but not my monitor!!!! 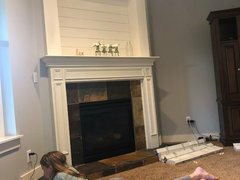 What colors will help my grey sofa look more grey, NOT blue? Painted Grey...Looks way too Blue!!! 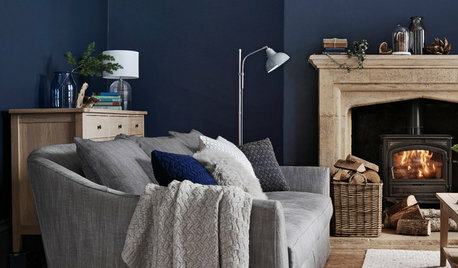 need RUG ideas to go with my light grey sofa and blue curtains...? Does this light blue rug match the grey couch? 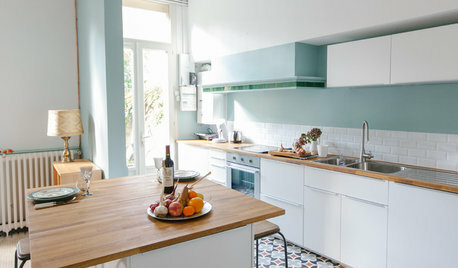 White Glass Tile turned Baby Blue! Help needed.